The presidential campaigns are continuing to wage an aggressive back and forth, especially in Ohio. But the devastating impact of Sandy will likely put a wrench in residents' plans to vote, and the tallying of those votes. NBC's Chuck Todd reports. With Election Day just one week away, state officials along the eastern seaboard are assessing the devastation done by Hurricane Sandy, which swept through the Northeast corridor and hit New Jersey and New York hardest. For the second day, early voting was canceled in Maryland, while some in-person absentee voting locations in northern Virginia were closed, and early voting was suspended in six counties in West Virginia, a state hit by high winds and heavy snow. 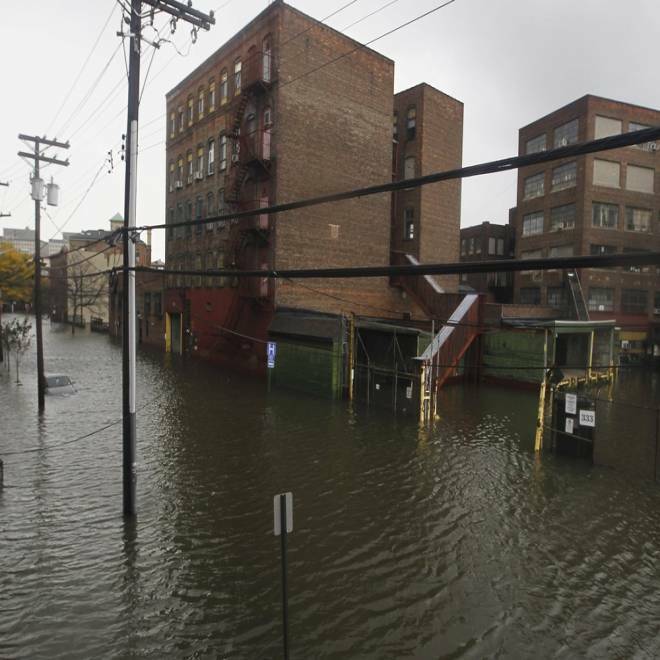 Floodwaters surround a car parked on a street in Hoboken, New Jersey Oct. 30, 2012. Sandy, one of the biggest storms ever to hit the United States, roared ashore with fierce winds and heavy rain near Atlantic City, New Jersey after forcing evacuations, shutting down transportation and interrupting the presidential campaign. But the looming challenge was for counties in New York, New Jersey, and Connecticut where the storm surge flooded schools and other locations designated as voting sites next Tuesday. Election officials in coastal counties were struggling to assess whether power outages might force changes in some of next Tuesday’s polling locations. The potential for disruptions to voting on Nov. 6 could depress voter turnout in storm-affected areas of New York and New Jersey, for example, but President Barack Obama is still likely to carry those two states with no difficulty. In Nassau County, N.Y., where the south shore was inundated by the storm surge and where there are more than 900,000 registered voters, towns such as Oceanside and Long Beach are now under a foot or more of water. Nassau County Board of Elections Commissioner William Biamonte said Tuesday that he and other officials were still trying to reach the emergency contact people at each of the polling locations in the flooded areas, but they’d been unsuccessful, as cell phone service was out in parts of the county. Before the storm hit, officials mapped polling locations in what FEMA designates as Category 1 storm areas: 68 of Nassau County’s 400 polling locations are in that flood-prone zone. One of them: when voters come to a polling location, they would be asked to fill out the ballot used in the county’s optical scan machines and instead of scanning them at the polling location (which is the normal procedure), those ballots could be taken to the county board’s office and scanned there. This option, he said, would delay the tallying of results by a day. Biamonte said he expects voter turnout of about 670,000 in the county next Tuesday but is concerned that about 300,000 of those voters, who vote only in presidential elections, will be unfamiliar with the optical scan machines the county has adopted since 2008. That unfamiliarity might add another element of confusion on Election Day. But “come hell or high water – which is what we just had – were going to be voting next week,” Biamonte said. As in New York, and in New Jersey too, power outages, massive flooding, and impassable streets are making it difficult for officials along the coast to assess polling locations. The county clerk’s office in Toms River, N.J., has extended its hours to accept vote-by-mail ballots. The office will stay open until 9 p.m. tomorrow through Saturday and open Sunday as well until 4 p.m., said Scott Colabella, the Ocean County clerk. Colabella added, however, that the clerk’s office currently does not have power and had to move its phone lines. In New Jersey, anyone can vote by mail without an excuse. Voters can request a ballot at a county clerk’s office until 3 p.m. Monday. Ocean County – one of the hardest hit areas in the state with its 45 miles of coastline stretching from Point Pleasant to Seaside Heights and down to Long Beach Island – has 411 precincts and 250 polling locations. Monmouth County, N.J., with its 27 miles of coastline directly to the North of Ocean, was also severely impacted. Its offices were closed Tuesday. Varano, who said county officials are coordinating with and awaiting more guidance from the state, said it will probably be five or six days before they know exactly the extent of the damage and what the county will realistically be able to do about voting. “Right now,” Varano said, “there are massive amounts of numbers of people without power” and that has meant he’s having a “hard time getting in touch with” some of those in charge at polling locations. His office is open, but doesn’t even have Internet yet, he said. Ocean County cast about 275,000 votes in the 2008 presidential election and is one of the most Republican counties in the state. In Connecticut, Secretary of State Denise Merrill will be holding a conference call at 10 a.m. Wednesday with at least 200 town clerks and voting registrars across the state in order to assess whether changes in polling locations might be needed next Tuesday. Merrill spokesman Av Harris said state officials do not yet know if some polling locations will need to be moved due to power outages or storm damage. Meanwhile, several counties in West Virginia were still under blizzard or winter storm warnings as of 11:30 a.m. Tuesday. “We’ve been calling counties that are under blizzard or winter storm warning – they’re measuring the snow not in inches but in feet – and even though some of these places have gotten slammed, they’ve still managed to open their early voting sites,” said Jake Glance, a spokesman for West Virginia Secretary of State Natalie Tennant. As for contingency plans for next Tuesday, Glance said most of the state’s 55 counties use touch-screen voting machines that can rely on battery power if electricity is still out in some places. He said Tennant’s office has been exploring the option of deploying generators in certain precincts to keep lights on and machines operating if electric power is still out next week. In Maryland, Gov. Martin O’Malley issued an executive order Tuesday ordering early voting centers to be open between 8 a.m. and 9 p.m. on Wednesday, Thursday, and Friday after the hurricane forced cancellation of early voting on Monday and Tuesday.